Wow! Sherri these are stunning - just stunning...what more can I say! I'm so happy that you were inspired to try something new! Love the little tidbits you included, like the South American origin of the technique you used...for some reason I've never thought about the origins of macrame! It was great fun playing off your piece - thanks for letting me!! 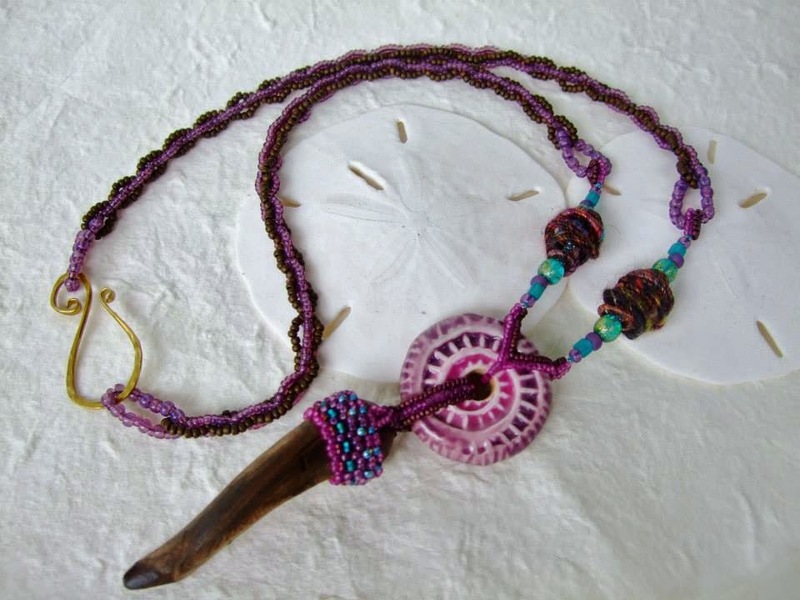 love the antler with the donut, you really captured the spirit of the bead! The donut really seemed to call for those rustic, organic elements, didn't it? when I first saw your post I was like, wow, they are sure on the same page! Then I realized it was a challenge within a challenge - excellent! 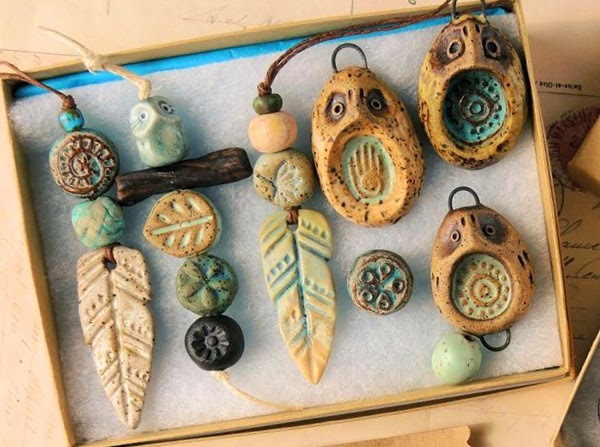 You did an amazing job, I love the wrapped antler piece and the recycled beads are perfect as well! Thanks so much for playing along this month! We do actually think enough alike that it would (or should) scare you, but I did do this one on purpose :) I had a lot of fun on this challenge! Stunning! I love the knotting around the antler, that's really clever :) I love how you've reflected Lindsay's design in your own style too, they look great together! I always like to see this type of challenge where everyone starts with the same component. It's amazing to me to see the different way each person approached it! How fun that you were inspired by Lindsay's design, then did a totally different spin on it. Yours is so much more earthy, rustic, and primitive in style. This is a great example of how artists can inspire each other without copying. Love it! I love the AJE challenges!! I love this one too, similar to Lindsay's design but so different at the same time. I love the soft neutral colors but so dramatic at the same time. Really beautiful! Wow wow wow! I am so in love with this. Thank you for creating this beautiful piece with my spiral fossil disc. Another 'wow' Cherie, this is so pretty ,beautiful colours, beautifully composed piece. I love it. This is rather different from your usual work but stunning as always! Can I just say 'oh wow! '..this is a stunning piece! Your macrame work is amazing! Beautiful! I always look forward to seeing your creations because I love your macrame and how you keep it fresh combining with other elements. I really loved Lindsay's necklace, and it's fun to see you riff on it. I love it as well. The colors are so different from hers, yet still lovely. Hers has so much texture, but so does yours in a different way. I love being able to compare the two. Looking at your piece boggles my mind, and makes my brain hurt! And I mean that ALL in the best way! I like your palette, the beads interspersed, a visual rest. Very cool, indeed. You are such a genius! All of your creations are a work of art...truly inspiring. Thank you!! I came across this post while doing some research for my own creating. I also include various pieces of bone into my jewelry and other artworks. I love the way the antler is wrapped and would like to try that out myself. Do you have any advice or a direction you can point me in to learn how to do that particular knot? I am very eager to learn.